Alfa von der Weyermühle gained her Schutzhund III title and received a 1B rating for character at the German ZTP. Alfa broke a tooth which prevented her from further work and competition. Her sire, Bingo von Ellendonk, was the winner of the D.V. Meisterschaft in 1977 and passed the Körung 'for life' with highest ratings for hardness, courage and working drives. Hera: SchH 3, DV-DM participant and passed the ZTP with 1A rating for character. and G for conformation. 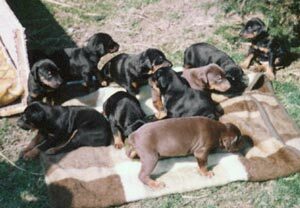 She is dam of the von der Weyermühle “L, Q, R, S” litters (Ohra, Qastra, Rasmus, Rashna, Rina, Shannon, Snoopy).